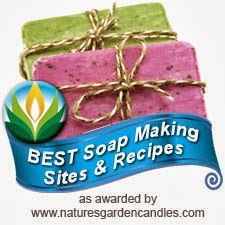 About 2 weeks ago I encountered the worst case of IP (intellectual property) infringement ever in my soap making life. It used to be mostly harmless infringement, most of the time the offenders didn't even know the photo they used belongs to me. As a digital age grows so widely spread across the world, the world wide web is filled with countless information and photos. Most of the people do not understand downloading and re-using information and (or) photos without creator's permission from the internet is illegal. Unless the information or photos are being re-used solely for educational purposes and not for profit, which falls under Fair Use guideline, it is simply an IP infringement. Under Fair Use guideline, direct quotation of information or photographs cannot be used for commercial purposes, or without attributing the author. Most of my photographs had been watermarked with my logo before circulating the world wide web. This owner of a teaching studio is known to be a repeat IP infringement offender since 2011. Apparently she had been using 6 of my photos for more than a year without me knowing. If she charges $35 per person per class, over the period of 18 months, how much revenue did she generated? What's worse is I am not the only one the business owner has stolen many photos from, there are at least 6 other soap makers I know of. After contacting the studio and got no respond, Other effected soap makers and I were forced to report her to the FaceBook and her web host. Most major web hosts and online multi-media sites observe DMCA (Digital Millennium Copyright Act) and have policy to respond to clear notices of alleged copyright infringement. All you need to do is filing a detailed report with the web host and they will have to investigate and perform a force-take-down. Fortunately Facebook reacted fast to my request and removed all my photos from her Facebook page. Our effort paid off, her website had been shot down for a few days to resolve all the IP infringement issues. During the period of time I had to track back my own internet activities to submit evidence of copyright ownership, I finally realized maybe this Photo Gallery page I provided on my blog had been providing people with easy access to steal my intellectual property, it was like a one-stop shop for free. I had to make the difficult decision to close my gallery down permanently. It had a good run for almost 5 years. All I want to do is sharing my hard work and hoping to inspire other people with the same passion. I never foresee this to end this way. Please, if you want to use my photos or other people's photos, do get permission first and don't forget to attribute the author properly! Respecting other people's intellectual property is to respect your own. I think it depends on the intellectual property. The soap world was built on sharing designs. Your blog is popular because of designs we can try to learn to be better soapers. Your famous poppy was done by someone else first and you used that idea for your own creation. 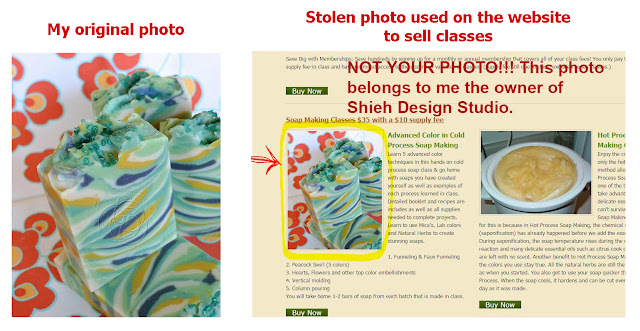 A photo shouldn't be stolen, but if having your art displayed on your blog helped you gain prestige, notoriety, free product from suppliers and increased business... then taking it down may hurt you worse in the long run. So it's just a thought about what intellectual property is most important to protect. Just to clarify, I am not closing the blog, just the photo gallery. I noticed people who steal photos usually not because they genuinely follow my blog as a reader. They use my photo gallery page as a one stop shop. That's the reason I decided to close the gallery, but I can assure you the blog is continuing. I agree that it is about sharing and inspiration, that will still continue. I have just found out your great blog. I am a big fan of natural soaps. best wishes from Poland. 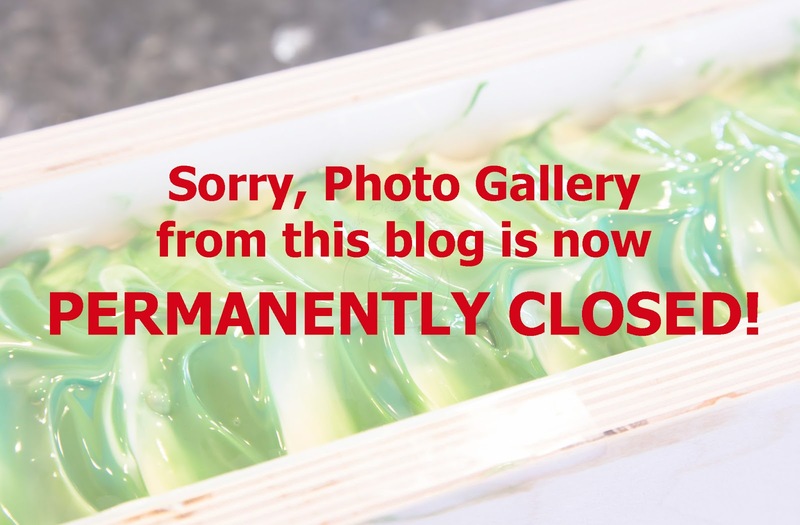 One would think that someone offering classes on advanced soap making would have made enough great looking soaps themselves to take photos of and use in their advertisements.... I really understand your anger.